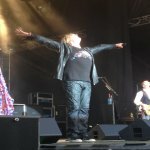 Def Leppard played the 7th show of the Summer Tour 2013 last night in Uppsala, Sweden with another shorter setlist played. The band started the show on time unlike the previous night in Helsingborg but still played a much shorter show than in Spain. 'Gods Of War' returned to the set but without the Steve Clark guitar solo video. 'Action' started the show again after having done so in Helsingborg for the first time since 2005. The show was attended by around 5,000 fans in the town square with many more watching outside the concert area and even on balconies and rooftops. 'Rock Of Ages' and 'Photograph' ended the show as usual before the early curfew time of 11pm. The next show takes place on 6th July in Skanevik, Norway. Live Blog?.